In Books Tagged In 19th Century Architects, Architectural History, Buffalo History, Esther Pariseau Mother Joseph, First Women Architects, French Canadian History, History, History of Washington State, Hotel Lafayette, Louise Bethune, Mother Joseph, North American History, Pacific Northwest, Providence Academy, Vancouver Washington, and Women Architects. 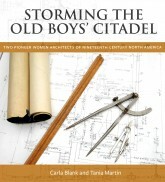 “Women” and “architecture” were once mutually exclusive terms. In an 1891 address, Louise Blanchard Bethune declared, “it is hardly safe to assert” that a connection even exists between the two words. Some women didn’t agree.